The Trump administration announced Thursday rules that would permit it to detain apprehended illegal immigrant children with their parents, reigniting the conflict over its zero-tolerance immigration policy. The proposed rule, if implemented, would void the court settlement that has governed the detention of children since the mid 1990s, and which has proved troublesome to the White House attempts to crack down on illegal immigration. Detention of children apprehended crossing the border illegally is currently governed by the 1997 agreement that resolved litigation between a group of unaccompanied minors and the Clinton administration. The deal, which settled Flores v. Reno, is commonly called the Flores Settlement Agreement (FSA). Among other things, Flores stipulated that children in immigration custody must be "released from custody without unnecessary delay." Under subsequent interpretation, this has in practice set a 20-day limit on the detention of children. Flores also requires that children be held in the "least restrictive setting appropriate to age and special needs." The problem for immigration enforcement officials comes when the terms of the FSA are applied to accompanied minors, e.g., children who arrive at the southwestern border with adults. In order to keep families together, officials must house adults in the same "least restrictive setting" as children and release them within 20 days. This, the administration has argued, can lead to trafficking of children across the border by parents or others, taking advantage of the lax detention of family units to enter the interior illegally. This concern was part of what provoked the administration's implementation of a "zero-tolerance" policy, prosecuting—and consequently separating from children—adults regardless of whether or not they came with children in tow. After the uproar this policy provoked, the administration sought to have the FSA revised or overturned, so that it could detain children with their parents while the latter faced criminal charges. As part of his June executive order ending the separation of adults and children apprehended at the border, President Donald Trump ordered Attorney General Jeff Sessions to file a request that the California District Court modify the terms of the agreement. However, Judge Dolly Gee denied Sessions's motion, contending that "Defendants' Application is a cynical attempt, on an ex parte basis, to shift responsibility to the Judiciary for over 20 years of Congressional inaction and ill-considered Executive action that have led to the current stalemate." Now, the administration is trying a different approach. Under modifications made to it in 2001, the FSA is meant to expire 45 days after the effective date of federal regulations implementing it. Two administrations have come and gone with no such regulations issued, but ICE's order on Thursday changes that. The issuing of such a regulation puts the administration on surer footing vis-à-vis its interpretation of Flores. It can subsequently interpret the regulation to suit its needs—interpretation to which courts must pay deference, according to past Supreme Court rulings—or simply repeal the regulation, ending Flores altogether. Most importantly, the new rules proposed Thursday would permit the detention of family units together for more than the 20-day window and in a Family Residential (i.e. detention) Center. This, the administration contends, helps to bring child detention in line with the needs and priorities of immigration policy in 2018. To do so, the rule creates an alternative federal licensing scheme so that detention centers for families need not be licensed by the state in order to detain family units—a requirement of Flores which has previously limited available detention space. The proposal would also substantially expand the number of Family Residential Centers. These sites currently suffer from routine overcrowding, with a capacity of just 3,500 according to the Washington Post. While the rule sets up the infrastructure for family unit detention, its authors contend that it would still implement the "relevant and substantial terms of the FSA," even while making "some modifications" to its "literal text." 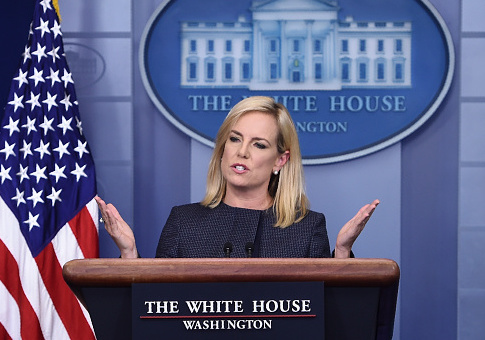 "Today, legal loopholes significantly hinder the Department's ability to appropriately detain and promptly remove family units that have no legal basis to remain in the country," said DHS Secretary Kirstjen Nielsen in a statement. "This rule addresses one of the primary pull factors for illegal immigration and allows the federal government to enforce immigration laws as passed by Congress." Immigration activists and their legal advocates are unlikely to agree. At least one House Democrat has already condemned the rule, and once it clears its requisite notice-and-comment period and is finalized, it is likely to face challenge in the same court of law where Flores was originally settled. This entry was posted in Issues and tagged Illegal Immigration, Kirstjen Nielsen, Trump Administration. Bookmark the permalink.